You guys…we have been going strong for a whooping one hundred and seven weeks!! Can we get a what what!!! Now, back to the reason we do this…we absolutely adore looking through your projects every single week and this week is no exception! Thank you ALL for coming back week after week!! We APPRECIATE y’all!! Thank you for featuring my Painted Pinecone Garland. Much appreciated! Great job on your project! Thanks for linking up with us! Thank you for featuring my mousse! Thank you so much for hosting. I always get so much inspiration from your readers. Have a great week and stay safe! 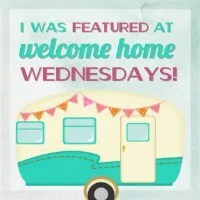 Thank you Erin for co-hosting the 107th Welcome Home Wednesdays. Hi Joy! Thanks for joining us!